When: Wednesday, January 13, 9:30 p.m.
TV: FSN Pittsburgh, the game will be broadcast in HD, available on Armstrong 179, Atlantic Broadband 782, Citizen 737, Comcast 226/774, DISH 428, DirecTV 659 and Verizon Fios 576. 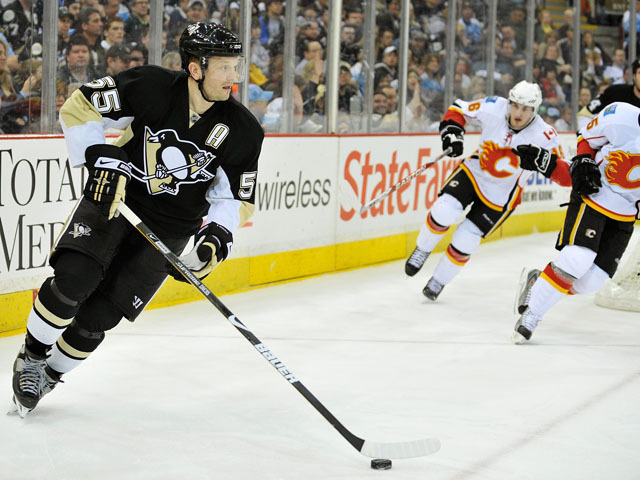 Season Series: This will be the only meeting this season between the Penguins and Flames. The two teams met last season in Pittsburgh on Mar. 25 when the Penguins skated away with a 2-0 victory. Kris Letang and Hal Gill scored for the Penguins while Marc-Andre Fleury made 31 saves in goal to post the shutout. Special Teams: These two teams are eerily similar in their special teams play – both are great on the penalty kill but struggle when they have the man-advantage. If one of these power plays can find a way to break out against the other’s stellar PK it could prove the difference in what should be a closely-played matchup. Calgary is on a 0-for-14 stretch with the extra skater while the Penguins went 0-for-6 against Minnesota on Monday. Help for Crosby: Sidney Crosby is proving yet again he is the best player in the NHL with a league-leading 29 goals, including five over his past three games. The Penguins are going to need more players to step up offensively to help their captain, who figures to garner plenty of attention from the Flames, especially given all the media scrutiny Crosby has faced with this being just the second visit of his career to Western Canada. Calgary has been one of the more consistent teams in the NHL following the lockout with four consecutive postseason berths entering this season. During that period they have won one Northwest Division title (’05-06) and have never finished with fewer than 94 points. If there is one criticism of the Flames it is that all four strong regular-season performances have preceded first round exits in the postseason. Through the first 46 games of this season the Flames are tied with the Colorado Avalanche atop the division with 46 points. Following last season’s early exit from the postseason, which was made all the more disappointing after Calgary went out and pulled the blockbuster trade to bring Olli Jokinen to play with Jarome Iginla, management cut ties with head coach Mike Keenan and replaced him with Brent Sutter. The brother of Flames general manager Darryl Sutter, Brent joins the Flames after two seasons with the New Jersey Devils. He guided the Devils to the Atlantic Division crown in ’08-09. Prior to coaching New Jersey he spent eight years as the owner, general manager and head coach of the Red Deer Rebels of the Western Hockey League. Despite the presence of two franchise defenders in Dion Phaneuf and Robyn Regehr the Flames made a huge splash at the NHL Entry Draft when they acquired a third one in Jay Bouwmeester from the Florida Panthers. Because of his impending unrestricted free agent status it didn’t cost the Flames much to reel in another big fish to their bucket – they sent above-average defenseman Jordan Leopold and a 2009 third-round draft pick for the services of the 26-year-old. Quite possibly the best skater in the NHL at any position, Bouwmeester is a behemoth at 6-foot-4, 212 pounds, yet he is nimble enough to be one of the top goal scorers among blueliners. He notched 15 goals and has 42 points last season for the Panthers. His offensive numbers are down this season, as he has 17 points (2G-15A) through 46 games, but his play in the defensive end has been stellar as usual as he leads the Flames with a plus-12 rating. Bouwmeester also has few peers when it comes to durability. His 26:31 average ice time trails only Dan Boyle of the San Jose Sharks (26:36). Calgary claimed winger Nigel Dawes off waivers from the Phoenix Coyotes over the summer and the 24-year-old has rewarded them with 10 goals and 23 points through 46 games to rank fifth on the team in scoring. Free agent signee Fredrik Sjostrom has only one goal and six points through 41 games but his forte is more being a top-notch penalty killer than it is a goal scorer. Calgary seems to possess a very talented group of forwards yet production-wise the Flames sit in the middle of the pack. That stat seems like one which can change at any instant. Captain Jarome Iginla leads the way for the Flames just as he has since he broke into the league with Calgary way back in the 1996-97 campaign. The two-time 50-goal scorer once again paces the team with 42 points (21G-21A) in 46 games despite scoring just one in his past nine games. If the dictionary wanted to post the picture of the quintessential power forward, they would use one of Iginla. He is a threat to score from pretty much anywhere across the offensive blue line and handling him in front of the cage is a major chore for opposing defensemen. Speedy Rene Bourque, signed by the Flames two summers ago, has been a scoring sensation this season after showing signs of breaking out last year. Bourque ranks second only to Iginla on the Flames with 17 goals and 37 points. He is fast approaching last season’s totals of 21 goals and 40 points, which were each career highs. The former University of Wisconsin star spent his first three seasons with the Chicago Blackhawks. Ollie Jokinen was acquired by the Flames from the Phoenix Coyotes at the trade deadline to provide Iginla with a No. 1 center, but the fit hasn’t been ideal. Jokinen does rank fourth on the team with 30 points (9G-21A) in 46 games but he hasn’t resembled the dominant point-per-game player he was over his final three seasons with the Florida Panthers prior to last season. Calgary continues to get surprising offensive numbers out of Curtis Glencross, whom they signed as a free agent prior to last season. After bouncing around several teams, Glencross has found a home in Calgary where he has used his speed and two-way acumen to become a top-six player. He has followed a strong first season where he notched a career-high 40 points (13G-27A) with 21 points (10G-11A) in 43 games thus far this season. The Flames would like to get more offense from David Moss, who lit the lamp 20 times last season but has only seven tallies through his first 41 games this season. You would be hard-pressed to find another team in the National Hockey League with a better top-end defensive core than what the Flames have assembled in Calgary and the numbers back that claim. The Flames rank fifth in the league with a 2.33 goals-against average heading into Tuesday’s games. Calgary’s “Big Three” of Jay Bouwmeester, Dion Phaneuf and Robyn Regehr each plays over 22 minutes a night and are among the best in the business. Bouwmeester (See New Faces above) might not be contributing offensively like he did last season but he has been a rock in the defensive end. His arrival and the heavy minutes he logs have helped make Phaneuf and Regehr even better players. If you were to take a poll ranking the top open-ice hitters in the game, there is little doubt Phaneuf’s name would appear on that list. The 24-year-old Alberta native is not afraid to step up out of position to throw his 6-foot-3 frame into opposing team’s top talent. After a down season last year in his own end he has once again become solid there this season. With eight goals and 18 points in 46 games his offensive numbers are strong once again. A strong second half could allow Phaneuf to challenge his career high goal total of 17 set in ’06-07 and matched the following season. Where Bouwmeester and Phaneuf provide a two-way game, Regehr is a classic defensive defenseman. His game is all frills and no thrills as Regehr has no problem whatsoever throwing his weight around. The 29-year-old alternate captain is every bit the presence of the other two with a 6-foot-3 build and a solid 225 pounds. A member of the 2006 Canadian Olympic squad, Regehr has 11 assists and an even rating in 45 games this season. The ever-improving play of Mark Giordano gives the Flames a fourth option who could be a No. 1 or 2 defenseman on most other teams. Giordano doesn’t possess the size of the other three at 6-foot, 203 pounds but he brings a smooth-skating and offensive presence to the fold. He is tied with Phaneuf for the team lead among blueliners with 18 points (5G-13A) through 46 games. He is one point from matching his career high of 19 set last season. Solid veterans Cory Sarich (plus-3 rating in 23 games) and Adam Pardy (eight points and a plus-5 rating) pick up the remaining minutes left behind, although neither player can be considered a slouch. It has been a bounce-back season in goal for Miikka Kiprusoff between the pipes after back-to-back ordinary seasons by his lofty standards. The 33-year-old backstop ranks in the top-five NHL netminders in wins (23, 4th), goals-against average (2.16, 5th) and save percentage (.927, 4th). When Kiprusoff is on his game he can combine his 6-foot-1 height with unbelievable athleticism and great rebound control to be one of the most impenetrable forces in the league. He was especially good during the ’03-04 postseason when he posted a 1.85 goals-against average and a .928 save percentage while leading the Flames to within one win of the Stanley Cup. Last season he established a new career high with 45 wins while starting 76 games for the Flames. On those rare nights when Kiprusoff does take off his backup is 26-year-old Curtis McElhinney, who has played in eight games this season with a 3-3 record, 2.69 goals-against average and a .904 save percentage. Daymond Langkow might not have developed into the elite point producer the Tampa Bay Lightning thought they were selecting with the No. 5 selection in the 1995 NHL Entry Draft, but he has carved out a nice career for himself. Later this season Langkow will suit up for his 1,000th career game. There appears to be no stopping the 33-year-old pivot, who seems to get better with age. Last season marked the first time in nine seasons that Langkow missed hitting the 50-point barrier – and that was just barely as he posted 49 points (21G-28A) in 78 games. A superb two-way center who can also kill penalties, Langkow had a career year with Calgary in ’06-07 by registering career highs with 33 goals, 44 assists and 77 points. Langkow is on pace for another 50-point campaign in ’09-10 with 30 points (11G-19A) through 46 games. Calgary has only one medical issue to report on as third-line center Craig Conroy is out on a week-to-week basis with an ankle injury. “It's where you need a goal, no question. We had a chance late in regulation and a 5-on-3 in overtime. You've got to capitalize on it. Let's face it, it's a must time to win the game. Our power play has to get better. It's not good enough right now." – Calgary head coach Brent Sutter talking to Yahoo! Sports after the Flames went 0-for-4 on the power play in a 3-2 shootout loss to the division rival Colorado Avalanche on Monday. 28.0: Calgary averages 28 shots on goal per game, the third-lowest total in the NHL. 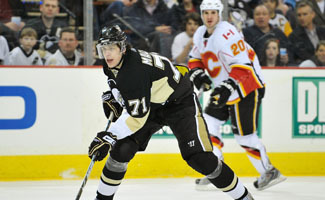 New Penguins iPhone/iTouch application available for FREE download! Look for "YinzCam Penguins" in iTunes.